The words that Jesus hurled at the scribes and Pharisees would be returned to Him in the form of scourging, of a crown of thorns, and of nails in His hands and feet. He knew it. He knew He was paving the road to Calvary with these condemning words, yet they were words that needed to be spoken. They need to be spoken today, as well. The outward forms of “religion” may have changed, but the heart of man does not change. There are those who insist that if we’re going to reach today’s youth, we need to make the Bible more “in tune” with the times. I submit to you that there is no more timely Book in history than the Bible. It speaks to the root of the problem: The human heart, which is deceitful above all things, and desperately wicked (Jer. 17:9). This is not the first era in history in which people seem to be turning away from God. If He tarries, it won’t be the last. Our job is not to entertain or be like the world in order to win the world. Our job is to lift up Jesus. Ye devour widows’ houses: A widow in Israel was most unfortunate unless her husband had left her financially secure. She had to depend on her family for her subsistence, and she was shown no mercy in the paying of temple fees and other taxes. If she had no money to pay the temple tribute, then her house could be taken away by the High Priest. I could hardly contain my giggles. I was delighted to know I wasn’t the only one who was bored brainless by the longwinded prayer. There’s a joke that made the rounds some time ago, about a little girl who had to listen to a verbose prayer. When it was over, she said out loud, “Help, Lord!” Which is really all we need to say, sometimes. Greater damnation: You scribes and Pharisees will receive a greater damnation than those over whom you rule with such an iron hand. Jesus really had a way with words, didn’t He? There are eight woes spoken in this chapter. This first one uncovers the hearts of the Pharisees, much to their chagrin. Jesus is building up their case against Him, at this point, with just about every word He speaks. Here, He tells them that they have willfully shut their eyes and turned away from the light of the gospel. Not only did they refuse to enter into the kingdom of heaven, but they warned others away as well. Their teachings, based on tradition, were far more precious to them than the offer of the Messiah, Who had come to fulfill the law and, by doing so, to set it aside and replace it with the grace of salvation. There are none so blind as those who will not see. Forgiveness is NOT. . . .
We have some very strange ideas about what forgiveness really is. One of those ideas is, when someone says “sorry,” to reply with, “Oh, that’s okay, it doesn’t matter, don’t worry about it.” That is not forgiveness. 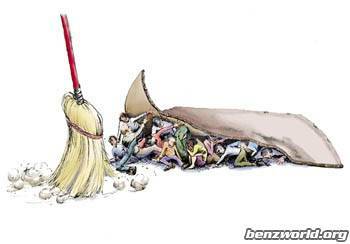 It is simply brushing the problem under the carpet. The only result that comes from doing so is to get a very lumpy carpet. The truth is, it DOES matter if someone has hurt you. It matters if you are offended, and especially if the person who hurt you has come with a heartfelt apology, that apology needs to be treated with the respect it deserves. So let’s talk about apologies for just a moment. Here are some really poor apologies: “IF I hurt you, then I apologize.” This is a poor apology because it isn’t sincere. The offender is actually putting the blame back on you; if you are offended, it wasn’t really his fault but he’ll say “sorry” so he’ll look better. And he’s really making sure you understand that he hasn’t done anything wrong. You’re just overly sensitive. Here’s one of my favorites, issued in the Rose Garden by Mr. Clinton: “Mistakes were made. . . .” This is a classic. It was given in the passive voice, There really isn’t a subject here. Nothing is receiving the action of the verb, the doer is not specifically named, and it wasn’t sin; it was just a mistake. He should have said, at the very least, “I have done wrong. Please forgive me.” It is a mistake to enter a number incorrectly into the checkbook. It is a mistake to mismeasure an ingredient in a recipe. It is SIN to deliberately choose to have sexual contact with a woman to whom one is not married. It is a SIN to lie about it; and it is cowardly to phrase an “apology” in such vague terms that no one has any clear idea what actually happened, or what is being said. These are not apologies. They are sorry excuses that allow us to refuse to accept responsibility for what we have done. There. Done. No equivocating, no lying, no blaming or excusing or dodging. Next week, two more things forgiveness is not. Whosoever Exalts Himself. . . .
No man is better than another. No man who exalts himself deserves the praise and worship of others. In fact, Jesus made it clear that the ones who choose to humble themselves will be the leaders, and the self-important will be reduced to servanthood. Does this teaching apply to Christians today? Well, of course! Don’t we all know of those who have exalted themselves as spiritual leaders when in actuality they are seeking only the praise of men? Don’t we know of humble men who have never put themselves forward, yet they are praised and respected for their humility and their walk with God? Don’t we all know of mighty church leaders who have come crashing down because of sexual sin? 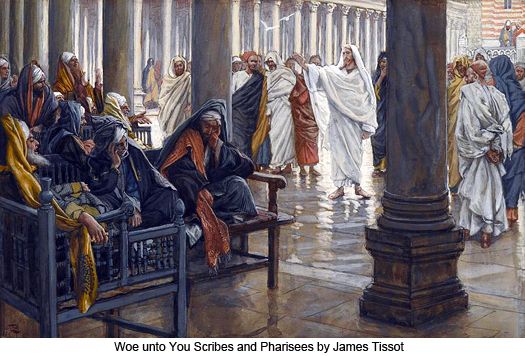 Why do we think it was only the Jews, only the Pharisees, that Jesus was warning? Surely we fool ourselves if we think we are exempt. In I Peter 5:6-7, we are commanded to humble ourselves under the mighty hand of God, that He might exalt us at the proper time. Notice that we are not told to ask God to humble us; we are to choose to humble ourselves under His mighty hand. Only when we voluntarily humble ourselves, knowing what we are and Who He is, can we hope to be rewarded by God in due time. Jesus wasted no effort to be tactful, politically correct, or accommodating to the tender egos of the Pharisees. He called them out for exactly what they were: Men who loved the high places of honor, and to be called “Rabb, Rabbi” with great respect and adulation as they passed by the people in the streets. (6) The uppermost rooms.—Better, the first places, the word “room,” which had that meaning at the time when the English version was made, having now become identical with “chamber.” Strictly speaking, they would be the first places, nearest to the host, on the couches or ottomans (as we have learnt to call them from their modern Eastern use) on which the guests reclined, these being assigned (as in the case of “the disciple whom Jesus loved,” in John 13:23) to the most favoured guests. The chief seats in the synagogues.—These were at the upper or Jerusalem end of the synagogue (corresponding to the east end of most Christian churches), where was the ark, or chest that contained the Law. These were given, either by common consent or by the elders of the synagogue, to those who were most conspicuous for their devotion to the Law, and as such, were coveted as a mark of religious reputation. To be called Rabbi was a mark of high honor, and acknowledgement of the teacher’s learning, wisdom, and spiritual superiority. Sometimes, the term Abba (Father) was used as a mark of even higher respect. I have been a teacher. I understand feeling good about being able to say, “I’m a teacher,” or now, “I’m a counselor.” Maybe even, “I’m a writer.” When you work hard to accomplish something, it’s nice to have it recognized. But Jesus was saying that these Pharisees loved, craved, sought recognition; lived for the honor of having the best places at the feasts, the most important seats in the synagogue. There was nothing of humility in them, because they loved themselves more than they loved God. As Jesus continued His scathing indictment of the Pharisees, He made reference to their penchant for outward display, done only to be seen of men. Their first love was not God, but the praise of men and the high places of leadership. So what on earth are phylacteries and borders? Phylacteries were used as observatories; that is, as reminders of the Law. In different parts of the Pentateuch, we read these words, “And thou shalt bind these words for a sign on thy hand, and they shall be for frontlets between tine eyes. And thou shalt write them upon the posts of thy house, and upon thy gates” Exodus 13:9-16, etc.). Orthodox Jews today write these words on a piece of parchment, enclose them in a tin box, and nail the box to their door posts. Tephillin, another form of phylactery, are two strips of leather to each of which is attached a small box; in these boxes are pieces of parchment with the Hebrew text of Deuteronomy 6:4-8. One leather strip with this box is wound around the forehead, the box resting in the middle of the forehead, while the second strip is wound around the left arm, which is nearest to the heart. Over the years, much ado has been made of these phylacteries and tephillin. It is even said in some Jewish writings that they keep demons from the home if they are worn at all times. The enlarged borders were simply fringes, as shown in the first illustration. The longer these fringes, the more ostentatious the wearer. Long fringes were a sign of importance and authority. The broad phylacteries were noticeable and drew attention to the wearer. Both of these symbols had been used by the Pharisees to establish hierarchy, and Jesus scorned them for exactly what they were: Pride. Nothing more, nothing less. Last week we started this passage, hearing Jesus tell the people to listen to the words the Pharisees spoke according to the law of Moses, but not to emulate them in their works because they do not practice what they preach. This verse today describes perfectly the corrupt rulers who burden the people but who avoid all burdens themselves. They live instead on the backs of those they rule, having no intention of sharing the burden with them. The Pharisees had placed themselves in Moses’ seat, and when their movement started they had great zeal for the law which God had given through Moses. In their Mishna,which was part of the Talmud, they stated that they were to be regarded as having been put in that place by Moses himself, and were to be obeyed. Period. Power corrupts, and absolute power corrupts absolutely. When authority can never be questioned, authority becomes a rule unto itself. When that happens, when the ruler(s) get away with ignoring established law, then the people bear the burden of supporting those rulers. Jesus told them to obey the law, as the Pharisees said; this was the part of His Law given to Moses and recorded in the five Books of the Law in the Old Testament. But the behavior of the Pharisees? No. The entire burden of keeping all the Law, including the nit-picking rules created by the Pharisees that God never ordained, was on the people. Oddly enough, there were always those who were willing to run to the authorities with tales of those who, knowingly or not, broke the man-made rules. Those poor victims of the tattle-tale system could actually be beaten, imprisoned, or fined in such an exhorbitant way that they actually became enslaved to the system. The Pharisees would not lift a finger to change any of their ungodly rules, because the factions within Phariseeism were too busy competing with one another to be concerned about the burden that was laid upon the people.